Watching TV series can be such an interesting way to spend your free time! Nowadays, there are a lot of TV series that you can choose from. Are you a fan of lighter, more comedic TV series, or do you prefer darker-themed series with a convoluted story line that hooks thinker-type of audiences? If you are a fan of TV series with twisted, unusual plot that tickles your curiosity with every new episode, you will love this one. Nowadays, Netflix is full of positively-reviewed series for you! One of them is ‘Russian Doll’, a comedy-drama like no other that has just aired this 2019. Although not a Russian series, the philosophy behind Russian doll is a running theme in this series, especially regarding the main character. Shortly, it can be described as a series where the main character is stuck in a ‘time-loop’, reviving after each death she faces. Of course, the actual story line is much more convoluted than that, and guaranteed you will be hooked from the first episode. So if you are looking for a new series to binge-watch in your spare time, you might want to take a look at this one. 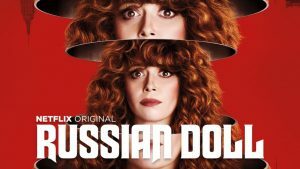 Here are 5 reasons why you should watch a new TV series “Russian Doll”! Most busy people these days probably don’t have much time to watch TV series, especially if it has a lot of episodes. You don’t have to worry, because currently Russian Doll has eight episodes and each one is only about 25 minutes in length, so you don’t need to set aside too much time if you can’t! Although each episode only has a relatively short duration, don’t worry, it has a suspenseful pace with a mood that can drastically change from relaxful to thrilling. If you have more time, you’ll find that you can’t stop yourself from clicking on the next episode, just because it really triggers your curiosity. However, not every part of the series is fast-paced, sometimes there are moments of psychological thoughts and philosophical reflections that allow audience to breathe for a while before revealing another shocking twist. It’s a roller-coaster thrilling ride that won’t take too much of your time in a day! Although it is categorised as a comedy-drama, Russian Doll series is much more than that. It is thrilling, confusing, philosophical, melancholic, sarcastic all in one. You’ll find yourself soon feeling involved in the plot, as our main character, Nadia, finds out that she keeps getting resurrected after her supposed death. She tries to solve and escape this so-called time loop to no avail, and each episode reveals a twist that leaves audiences’ minds blown more than ever. It’s not a plot you can guess or say, ‘I knew it’! The series is starred by great cast, part of the reason why this series has received so much positive reviews. The main lead character and co-creator, Natasha Lyonne, is an Emmy-nominated actress who has won multiple awards in the television industry, and she portrays the distraught character of Nadia perfectly. She acts out Nadia’s complex emotional dilemma in a really compelling way. The main character’s job is actually a video game creator or a software engineer, and she does a great job in explaining complicated themes like relativity, the concept of time, and morality that might be confusing to the audience at first. The title itself, ‘Russian Doll’, has been linked to how the complex character of Nadia gets revealed piece by piece as the series progresses—just like how Russian dolls reveal a deeper side of them every time you open them one by one. Aside from Lyonne, other well-known actors and actresses also add charisma to the show, like Greta Lee, Yul Vazquez, Charlie Barnett, and Elizabeth Ashley. Numerous television critics have expressed their positive remarks towards this show! It even gained a score of 89 out of 100 based on 24 critics on Metacritic, and is currently holding a score of 96% at Rotten Tomatoes. Russian Doll is described by critics as a series which always surprises the audience with endless new twists, and can bring audience’s mood from laughing really hard to pondering about deep things in life, especially with the astonishing portrayal by Natasha Lyonne. Another critic from IGN even gave the first season a perfect score, describing the series as an unpredictable one, easily making it one of the best TV series of the year. Meanwhile, Indiewire gave Russian Doll a rating of A-, praising the line of writers for such a crafty plot along with communicating with the audience about big philosophical questions such as life’s happiness and depression. This series’ plot is so bizarre that audience will undoubtingly have their own theories and predictions on what will happen next, and the reason behind the main character’s ‘time-loop’. At the same time, each episode always unfolds new findings that ruin your guess, so you will keep on wondering what might happen next. This makes audience really curious that they will not stop watching at just one episode—in other words, it will get you hooked! So, those are the 5 reasons why you should watch a new TV series “Russian Dolls”, especially if you’re a fan of thrilling drama series with a deeper plot that got you thinking and pondering all the time. Give this one a try and rest assured, it won’t be long before you finish all current episodes from the series! Meanwhile, you can also check out these interesting facts about Russian dolls and where to buy them.